The votes are in! Our next Guest Chef has been decided! Several weeks ago, we called on you, the fans, to submit your best plant-based dishes and vote for your favorites. After competitive voting, here are your top three choices, and more about what inspired their unique recipes. 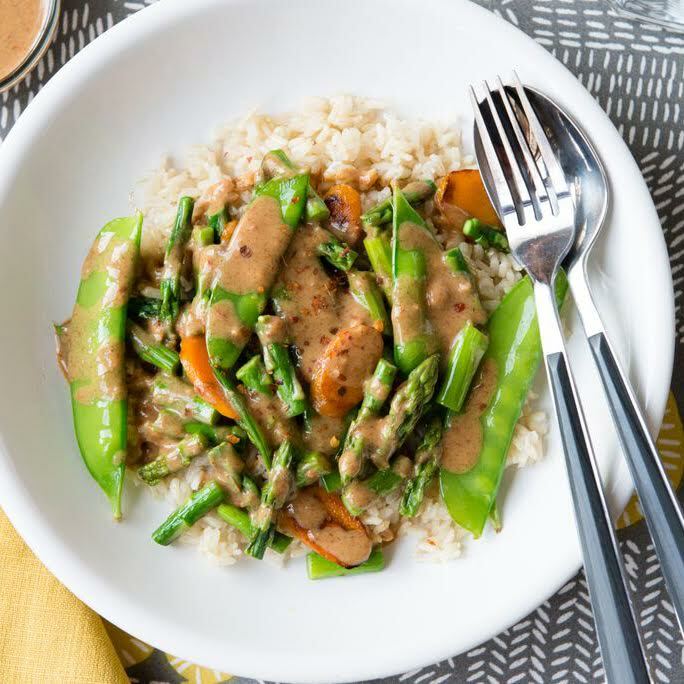 Third place goes to Jen H., with her colorful Asparagus Stir-Fry with Almond Butter Sauce!What was your inspiration for this meal?Lindsey Johnson (co-worker) created the almond butter sauce last year and I have been addicted to it ever since. We're always trying to find new ways to use it— that's where asparagus came into this recipe and won us over. The textures and flavors work so well together! Everyone who is brave enough to try it loves it.What is your best advice for eating plant-based?Start your day with a green smoothie. This allows you to pack in the plants immediately and set a plant-based intention for the day. I tend to crave and enjoy more fresh, whole foods when I have a green smoothie for breakfast. When I skip that and go for the coffee and bagel, I almost always crave pizza for lunch. Green smoothies are what got me to fall in love with plant-based meals!What is your spirit animal?Huh?! I've never been asked that before! I just went online and took a Spirit Animal quiz. Supposedly, I am a Cat, which in real life I am allergic to. ;)You can follow Jen on Instagram @simplegreensmoothies and her blog at https://www.simplegreensmoothies.com. 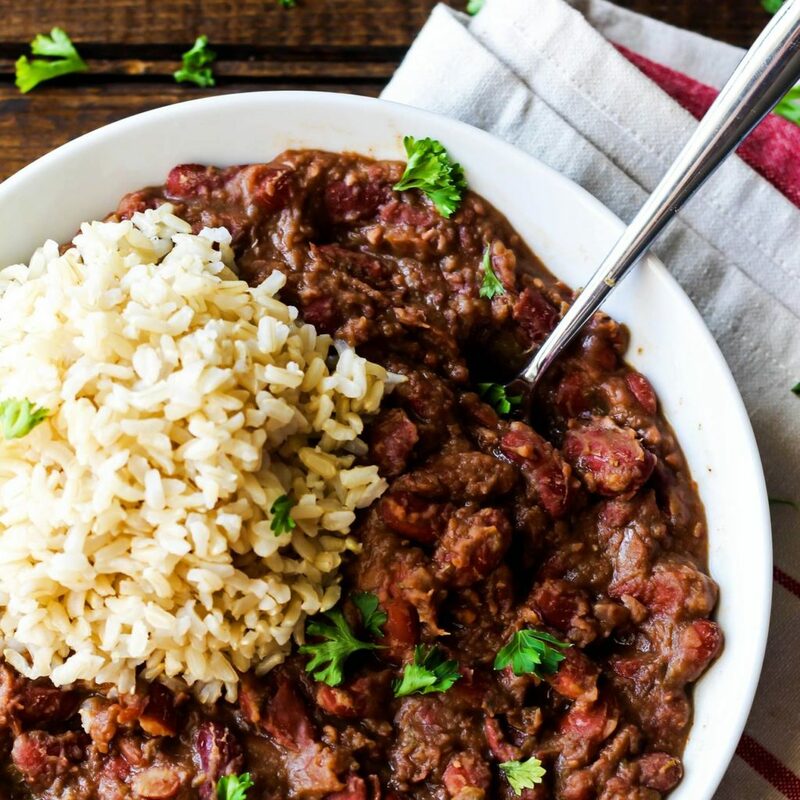 Second place goes to Emilie H., with her hearty Cajun-Style Red Kidney Beans and Brown Rice!What was your inspiration for this meal?I’ve lived in south Louisiana my whole life, a place that is known best for its decadent food. Food equals family, love and community here. But it’s hard to find plant-based versions of famous Southern dishes, so I made my own - starting with this Cajun-Style Red Beans & Rice! It has all the Cajun flavors we love without the sausage. It’s a reader favorite!What is your best advice for eating plant-based?My best advice for eating plant-based is to make healthier versions of classic dishes to get the whole family on board with eating plant-based. For example, if your family does a Friday pizza night, start making plant-based pizza with cashew cheese and lots of vegetables! There’s no need to make new, elaborate meals - just try plant-based versions of your favorite foods like chili, brownies, taco, sandwiches, etc.What's the funniest thing that has happened to you at a restaurant? I guess this isn’t necessarily funny, but more surprising and very delicious. ;) At a classic Italian restaurant in Colorado, there were no explicit vegan dishes on the menu. I asked the waitress for plant-based options, and they were actually able to make a risotto (full of butter, cheese and pork) vegan with olive oil and “meaty” mushrooms. It ended up being one of my favorite meals I’ve ever eaten! Talk about a surprise.You can follow Emilee’s Instagram @emilieeats and visit her blog at emilieeats.com.Congratulations, ladies! These finalists will be taking home a 21-Day Kickstart Pack! And finally, the grand prize winner who will be featured on veestro.com, have their dish featured on the Veestro menu, and receive 3 months of Veestro meals is...Raffinee E., with her gorgeous Cilantro Lime Tahini Buddha Bowl!What was your inspiration for this meal?I wanted to create something that was a nutrient powerhouse, yet had a diversity of textures and a variety of flavor. As a mom of three, it was also important that this meal was fairly inexpensive and uncomplicated to make. 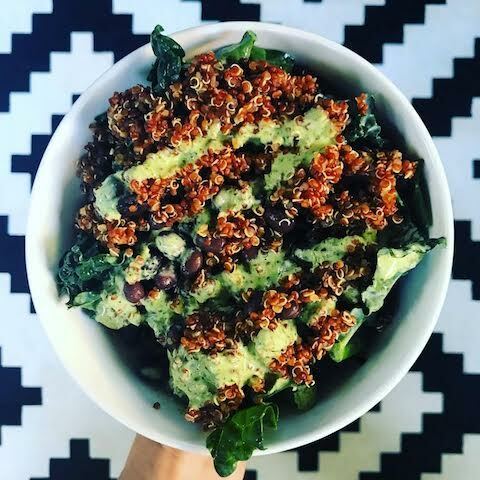 The warm black beans and fluffy quinoa makes this an incredibly satisfying meal while the rustic Tuscan Kale satisfies the crunch factor. Paired with the contrasting flavor profile of the tangy cilantro lime Tahini sauce that helps keep this hearty dish fresh, my Buddha Bowl is bound to be a favorite for omnivores and Vegan veterans alike!What is your best advice for eating plant-based?For me, transitioning to a plant based lifestyle was all about experimenting with Vegan versions of my favorite meals. In the beginning I relied heavily on vegan food blogs and cookbooks to guide me through mealtimes. I found a few favorite recipe developers and just rotated through their creations. As I got more comfortable cooking without animal products I began to throw things together on my own. Now, with three children under 18 months, (yes you read that right) it's all about simplicity.In addition- do your research! My journey to a plant based lifestyle hasn't been a linear path, but once I really dove head first into the research it became harder and harder to go back to eating the Standard America Diet. By way of documentaries, books, and scientific journals, I started to view food through an entirely different lens. Its like this shift happened when I realized just how many things were impacted by my food choices. I couldn't unlearn the realities of the food industries and animal products naturally phased themselves out of my diet.What is the theme song of your life? Ok...this is a really hard question!! I'm breaking the rules a little bit and giving you THREE regular's since it seems to change with each phase of life. 1. Sing a Song by Earth Wind and Fire 2. Valerie by Amy Winehouse 3. Gold on the Ceiling by The Black Keys, but honestly Clapton and Florence should have made this list too!You can follow Raffinee on Instagram @Raffinee or @theveganfind, where she features all things vegan, not just food.